Federal programs that fund domestic violence support centers are feeling the effects of the government shutdown. As Sofia Rudin reports, local groups depend on that money to stay open. 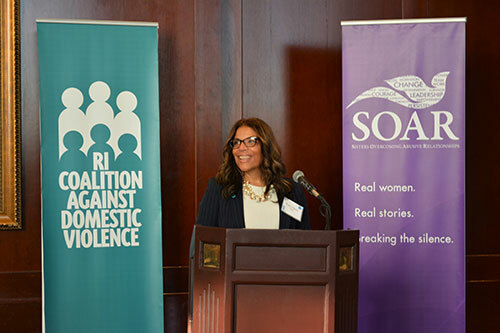 The Rhode Island Coalition Against Domestic Violence receives about $1.5 million each year in grant funding from the Violence Against Women Act and the Victims of Crimes Act, which the Coalition distributes among shelters and resource centers throughout Rhode Island. That funding comes in monthly installment to reimburse the agencies for the services they provided for victims during the previous month. The Coalition expects to receive reimbursement by Friday, January 18th for services Rhode Island agencies provided in December. However, if the shutdown continues, they would not be reimbursed for services provided in January or beyond. Executive Director Tonya Harris said her organization is prepared with a cushion of funding for the short term. “We know that if this continues over the next several weeks into the next several months, we know that it will certainly affect Rhode Island, its member agencies, and more importantly those who are receiving direct services,” Harris commented. Those direct services operating shelters and staffing resource centers for victims of domestic violence and sexual assault in Rhode Island. Harris said domestic violence groups around the country are starting to feel the strain. “Some of the member agencies across the country are having conversations now about the possibility of having to furlough or lay off staff,” Harris said. If the shutdown stretches beyond the next several weeks, Harris said organizations in Rhode Island may need to cut staff or services. Editor’s Note: an earlier version of this story implied that the Rhode Island Coalition Against Domestic Violence is currently experiencing a freeze on funding. If the shutdown continues through 1/18/19 they will not receive federal grants from the VAWA and VOCA.